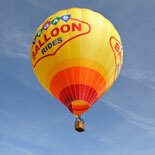 A hot air balloon ride is one of the most romantic ways to see the city and start the day. Your flight will take you over the Las Vegas Strip and soaring above the Red Rock Mountains. After enjoying a 1-hour flight and journeying wherever the wind may take you, you will be treated to a luxurious feast of champagne and hors d’oeuvres. When you need to get away from it all or simply gain a bird’s eye-view of Las Vegas, this is the ideal solution. Experience complete tranquility and peace as you float gently in the sky and take in panoramic views of Las Vegas that are completely unobstructed. Your flight will begin with a pick-up directly at your hotel. Just a short drive later you will arrive at the location of your launch and will be invited to watch as the colorful balloon is filled with hot air and comes to life. As you gently lift off, you will enjoy the gorgeous surrounding landscape and views of Las Vegas that can only be enjoyed from above, including the world-famous Las Vegas Strip and the Red Rock Mountains. Drift silently above the city as it still sleeps and take in the sights that have made Las Vegas famous. As part of your flight, you will receive a spectacular view of the majestic Red Rock Mountains. Be sure to remain on the lookout for wildlife as they can be easily spotted below. After drifting peacefully in the wind for approximately one hour, your flight crew will begin to prepare for your landing before offering you a hot air balloon tradition, a decadent champagne toast, while soaking of the beauty and tranquility never before experienced. Your entire adventure may vary from 45 minutes to 4 hours depending upon the visibility, winds, and levels of precipitation.